Qian Xin is qualified with an Honors Degree in Bachelor of Science in Physiotherapy from Trinity College Dublin. She previously worked in Ng Teng Fong General Hospital for over 4 years before moving on to private practice. 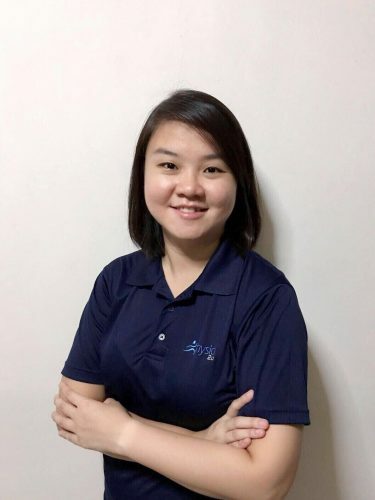 Qian Xin has invaluable experience in working with patients in various areas such as neurological, geriatrics, cardiopulmonary, orthopaedics and musculoskeletal pre- and post-surgical rehabilitation. In her third year, she then went on to specialize in musculoskeletal physiotherapy for 2 years. Qian Xin speaks fluent English and Hokkien. With her strong belief in a holistic approach towards her treatment approaches, Qian Xin develops a keen interest in the analysis of the entire body movement system. She is also certified in Dry Needling. Integrating her knowledge in the entire body movement system with her skills in manual therapy, she develops an individualized rehabilitation program for her clients. She believes that empowering people with the knowledge in understanding how their body works and the skills in managing their injuries is key to ensuring effective treatment, hence positive results in the treatment outcomes. Apart from clinical work, Qian Xin also enjoys people-watching and/or reading books while enjoying a cup of coffee at cafes.